A Kolkata-class destroyer ship, INS Chennai, will be commissioned into the Indian Navy's combat fleet on Monday . 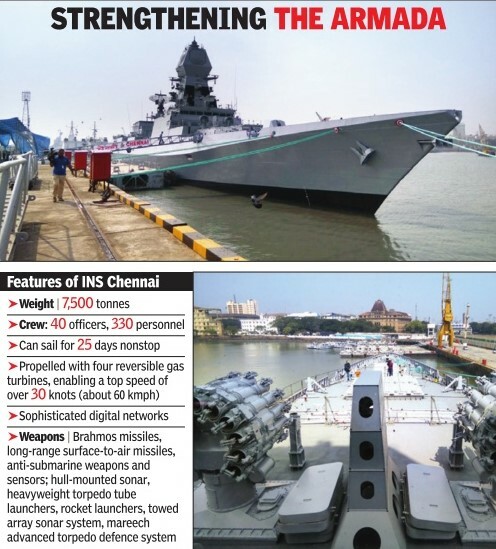 The indigenously built warship is the largest-ever warship to be built in India.Defence minister Manohar Parrikar will be commissioning the warship at the naval dockyard in Mumbai. “The ship is equipped with a decoy that can divert a missile attack. Nearly 60% of the ship was built at Mazagon Dock, while weapons and sensors were brought from Israel and Russia. Destroyers are second only to aircraft carriers in projecting raw combat power,“ said an official. “The ship is designed to carry and operate up to two multi-role combat helicopters,“ said vice-admiral Girish Luthra (chief of naval command western command). Induction of INS Chennai, the third and last of the Kolkata-class destroyers, was built at Mazagon Docks for over Rs.4,000 crore a piece. The warship will be the 10th destroyer in India's combat fleet. The Navy plans to become a 200-warship force with around 600 aircraft and helicopters by 2027.